Prostate adenocarcinoma (PC) is the sixth most common malignancy and the second commonest cancer in men worldwide. It is the most common cancer in men in Europe, North America, and parts of Africa. In India, it is among the top 10 leading sites of malignancy according to the Population Based Cancer Registries constituting around 5% of all cancers., It is the second leading site of cancer among males in large Indian cities such as Delhi, Kolkata, Pune, and Thiruvananthapuram and the third leading site of cancer in cities such as Bangalore and Mumbai. Sometimes the diagnosis becomes a challenge because numerous benign prostatic and nonprostatic lesions and normal structures can be very similar to prostatic adenocarcinoma. Therefore, knowledge about the mimics of PC is important to avoid misdiagnosis. A consecutive prospective histopathology study of the radical prostatectomy and transurethral resection of the prostate (TURP) specimens received in the pathology department of a medical college was done for a period of 2 years. A brief clinical history followed by a clinical examination, digital rectal examination (DRE), and transrectal ultrasound (TRUS) findings were noted along with investigations like serum prostate-specific antigen (PSA) levels. The received specimens were fixed in 10% neutral buffered formalin, and routine paraffin processing was done, followed by hematoxylin and eosin (H and E) staining of sections. All the slides were examined under microscope, and each case was studied with respect to age, clinical presentation, PSA levels, and microscopic picture, based on which a final diagnosis was given. After classifying the cases into three groups – adenocarcinoma, benign hyperplasia of prostate (BHP), and mimics of PC, the clear-cut cases of BHP without any other pathology were excluded from the study. Older Gleason's grading system was used for grading the carcinomas. Immunohistochemistry (IHC) was not done due to nonavailability of IHC in our institute. This study comprised 50 cases, of which 28 cases (56%) had PC and 22 (44%) cases were mimics of carcinoma. Basal cell hyperplasia (BCH) was the most common mimic (13/50; 26%) [Figure 1]a cases followed by prostatic intraepithelial neoplasia (PIN) (4/50; 8%) [Figure 1]b, prostate atrophy (2/50; 4%), clear-cell cribriform hyperplasia (CCCH) (2/50; 4%) [Figure 1]c, and atypical adenomatous hyperplasia (AAH) (1/50; 2%) [Table 1]. The mimickers were focally present in the biopsies studied and were not present in the adjacent areas of malignancy. Peak age incidence of PC was noted in the seventh decade with 12 of 28 cases (43%). Mimics of prostatic carcinoma had a peak incidence in the sixth decade (63.6%) [Table 2]. The clinical features included obstructive urinary symptoms, frequency, urgency, nocturia, and dysuria in all the cases. Patients of PC, in addition, showed symptoms such as hematuria and backache in 10% and 6% cases, respectively. In 89% of cases of adenocarcinoma, PSA was above >10 ng/mL, and in 86% of mimics of cancer it was <4 ng/mL [Table 3]. Older Gleason's grading was done in all the 28 cases. Scores up to 5 were low-grade tumors, whereas high-grade carcinomas were of scores 9–10. Tumors with scores of 6-8 were of intermediate grade. 12 (43%) cases had intermediate grade, followed by high grade in 10 (36%) cases. The common patterns seen in our study were pattern 2, pattern 3 [Figure 2]a, pattern 4, and pattern 5 [Figure 2]b. The prominent features noted were tumor cells with nuclear enlargement and hyperchromasia and prominent nucleoli at places [Figure 2]c, and these cells were seen infiltrating the stroma. The absence of basal cell layer in the majority of cases and the presence of perineural invasion in few cases were the other important microscopic features seen in adenocarcinoma [Table 4]. IHC was not done in our study for diagnosis of the cases. In our study, of 50 cases, 28 cases (56%) were neoplastic lesions and 22 cases (44%) were pseudoneoplastic lesions and nonneoplastic lesions. The incidence of neoplastic lesions was relatively higher in our study than in the other studies. Various factors can contribute to this disparity. First and foremost was the exclusion of BHP in our study which usually forms the majority of cases in various studies. Nowadays, the incidence rates of prostate carcinoma have been influenced by the diagnosis of cancer in early stages. As this study was carried out in a tertiary health institution, the number of cases of adenocarcinoma was relatively more as better diagnostic facilities like serum PSA, TRUS, and histopathology study were available to the patients. PC is mainly a disease of the elderly with more than 70% of the cases occurring in men above 65 years of age. The highest incidence rate of PC was observed among patients between 70 and 80 years of age in our study [43%]. While the increasing age, race, and family history are the only well-known risk factors, the incidence in various countries and ethnic groups specifies that the pathogenesis involves strong relationship between environmental and hereditary factors. However, no demonstrable correlation with diet, sexually transmitted diseases, sexual habit, smoking, or occupational exposure has been noted. PC is usually asymptomatic and presents with symptoms only when the patients have locally advanced or metastatic lesions. The mimics do not have specific clinical presentation. There was overlapping of clinical symptoms in most of the cases like retention of urine, frequency of micturition, and urgency in most of the cases, but hematuria and backache were present only in PC cases. Serum PSA, DRE, and TRUS are the tools most commonly used to screen for PC. In our study, 89% of cases of carcinoma had PSA above >10 ng/mL. PSA is secreted by all, but the most undifferentiated prostatic tumors; in a study by Ackerman et al., almost half of patients with adenocarcinoma had levels more than 10 mg/mL. In three of the mimics, PSA was >4 ng/mL and in the rest it was <4 ng/mL. This is in accordance with Robbins et al. who noted that serum PSA can be elevated in conditions such as prostatitis, DREs, TRUS, older age group, and in patients with enlarged hyperplastic glands. The main histopathological features of malignancy which help in differentiating adenocarcinoma from its mimics are abnormal architectural pattern, absence of basal cells, and nuclear atypia in the form of nuclear enlargement and nucleolar enlargement. Nucleomegaly and absence of basal cell layer were observed in 93% and 86%, respectively, in this study. Prominent nucleoli were seen in 60% of cases. Not all adenocarcinomas have prominent nucleoli as they may be obscured by hyperchromatic nuclei or overstained sections and can sometimes be difficult to distinguish after formalin fixation. The minor histopathologic criteria of PC are intraluminal wispy blue mucin (blue-tinged or basophilic mucinous secretions), pink amorphous secretions, mitotic figures, intraluminal crystalloids, adjacent high PIN, and amphophilic cytoplasm. Gleason's grading system remains one of the most powerful prognostic predictors in prostate cancer. In our study, intermediate grade adenocarcinoma was most common group, the next being high-grade carcinoma. Perineural invasion was found in three malignant cases (3/28) in this study and was not observed in any of the benign cases studied. Perineural invasion is regarded as pathognomonic of prostate cancer if there is circumferential or intraneural invasion by the tumor cells. The major limitation of our study was that our institute did not have IHC facility, and therefore IHC was not applied for the diagnosis in this study. Diagnosis of PC is based on histopathogical examination, and IHC plays an auxiliary role. It should be used in doubtful cases only. The IHC panel for prostatic carcinoma usually includes at least one basal cell–specific marker and the prostate cancer–specific marker AMACR. The most commonly used basal cell–specific markers in prostate cancer are HMWCK and clone 34βE12 circumstances. BCH occurs in about 23% of whole prostatic tissues. It can occur in a background of inflammation and after radiation or hormonal therapy. It was the most common entity in the nonneoplastic group, accounting for 26% of the total cases. BCH, mainly with a glandular architecture or when florid, may be confused with adenocarcinoma and can be distinguished from it by its basophilic appearance. The glands are basophilic at low power because of the multilayering of basal cells, which have scant cytoplasm. In contrast, adenocarcinoma of the prostate has more abundant cytoplasm, resulting in a more eosinophilic appearance to the glands. The occurrence of PIN in TURP specimens as such is reported to be relatively 2%–4%. We noted an incidence of 8% cases of PIN in this study. It can be confused with PC because premalignant proliferation of atypical epithelial cells produces a layer of crowded, pseudostratified cells with cytologic atypia, such as nuclear irregularity, nucleomegaly, hyperchromasia, and prominent nucleoli. PIN glands characteristically contain basal cells around their periphery, seen as a thin and occasionally discontinuous layer on H and E-stained sections. This is an important diagnostic feature because the presence of basal cells can help differentiate PIN from prostatic adenocarcinoma in which the basal cells are absent. CCCH and prostatic atrophy (PA) were the next common nonneoplastic entities and accounted for 4% of cases. CCCH consists of cribriform glands having uniform round lumina and clear cytoplasm, hence the name “clear-cell cribriform hyperplasia.” At low power, the lesion generally has a nodular appearance, and intervening cellular stroma is seen. CCCH is a close mimic of Gleason's grade 4 cribriform prostatic carcinoma. Nodular proliferation, bland cytology, presence of cellular fibrous stroma, and the presence of basal cell layer help in the diagnosis of CCCH over PC. PA, especially the partial atrophy variant, causes difficulty in the differential diagnosis of adenocarcinoma. The cells in PA have a pale cytoplasm lateral to the nuclei giving rise to pale staining glands that more closely mimic cancer. The absence of infiltrative growth, macronucleoli, and nucleomegaly and the presence of basal cells are factors with the greatest power in diagnosing benign atrophy. Besides the above histopathological lesions, a number of other histoanatomic structures such as Cowper's gland, seminal vesicle, verumontanum mucosal glands, mesonephric glands, and paraganglionic tissue can be confused with adenocarcinoma. Inflammatory processes including granulomatous prostatitis, xanthogranulomatous prostatitis, and malakoplakia may simulate high-grade adenocarcinoma. Sclerosing adenosis, nephrogenic adenoma, and few others can also have striking resemblance to prostatic adenocarcinoma. However we did not find any of the above lesions in our study. Biopsy still remains a gold standard for diagnosis of PC. All the lesions in the above study were diagnosed on routine H and E staining. Knowledge about the mimickers is very important to differentiate them from adenocarcinoma. IHC is useful especially for lesions in the grey zone but not in routine histopathological study and should not be used as a screening test but should be applied in specific selected cases only. Pakzad R, Mohammadian-Hafshejani A, Ghoncheh M, Pakzad I, Salehiniya H. The incidence and mortality of prostate cancer and its relationship with development in Asia. Prostate Int 2015;3:135-40. Yadav M, Desai H, Goswani H. Study of various histopathological patterns in prostate biopsy. Int J Curr Res Rev 2017;9:58-63. Hariharan K, Padmanabha V. Demography and disease characteristics of prostate cancer in India. Indian J Urol 2016;32:103-8. Ghagane S, Nerli R, Hiremath M, Wagh A, Magdum P. Incidence of prostate cancer at a single tertiary care centre in North Karnataka. Indian J Cancer 2016;53:429-31. Jain VK, Khare V, Tantuway R. Study of incidence of carcinoma prostate in central India with reference to Gleason's grading. Int J Med Res Rev 2013;1:169-176. Liu Z, Leong Q, Teo HY, Lee YM. Prostate carcinoma presenting with symptoms mimicking rectal cancer. Ann Acad Med Singapore 2014; 43:285-7. Rosai J, Ackerman LV. Male Reproductive System. In: Rosai Ackerman's Surgical Pathology. 9th ed.by Juan Rosai. St. Louis, MO: Mosby, Vol. 1; 2004. p. 1369. Epstein JI. The lower urinary tract and male genital system. In: Kumar V, Abbas AK, Fausto N, Aster JC (eds. ), Robbins and Cotran's Pathologic Basis of Disease, 8th Edn. Philadelphia: Saunders an imprint of Elsevier, 2010. pp. 97. Algaba F, Epstein JI, Aldape HC, Farrow GM, Lopez-Beltran A, Maksem, J et al. Assessment of prostate carcinoma in core needle biopsy – Definition of minimal criteria for the diagnosis of cancer in biopsy material. Cancer1996;78:376-381. Leroy X, Aubert S, Villers A, Ballereau C, Augusto D, Gossel B. Minimal focus of adenocarcinoma on prostate biopsy: Clinicopathological correlations. J Clin Pathol 2003; 56: 230-32. Gordetsky J, Epstein J. Grading of prostatic adenocarcinoma: Current state and prognostic implications. Diagn Pathol 2016;11:1-8. Harnden P, Shelley MD, Clements H, Coles B, Tyndale-Biscoe RS, Naylor B, et al. The prognostic significance of perineural invasion in prostatic cancer biopsies: A sys-tematic review. Cancer 2007;109:13-24. Leite KR, Srougi M, Sanudo A, Dall'oglio MF, Nesrallah A, Antunes AA, et al. The use of immunohistochemistry for diagnosis of prostate cancer. IntBraz J Urol 2010;36:583-90. Garg M, Kaur G, Malhotra V, Garg R. Histopathological spectrum of 364 prostatic specimens including immunohistochemistry with special reference to grey zone lesions. Prostate Int 2013;1:146-51. Thorson P, Swanson PE, Vollmer RT, Humphrey PA. Basal cell hyperplasia in the peripheral zone of the prostate. Mod Pathol 2003;16:598-606. Xu Y, Wang Y, Zhou R, Li H, Cheng H, Wang Z, Zhang J. The benign mimickers of prostatic acinar adenocarcinoma. Chin J Cancer Res 2016;28:72-9. Silverio FD, Gentile V, Matteis AD, Mariotti G, Giuseppe V, Luigi PA, et al. Distribution of inflammation, pre-malignant lesions, incidental carcinoma in histologically confirmed benign prostatic hyperplasia: Retrospective analysis. Eu Urol 2003;43:164-75. Humphrey PA. Disease of the prostate. In: Wick MR, LiVolsi VA, Pfeifer JD, Stelow EB and Wakely PE, editors. Silverberg's Principles & Practice of Surgical Pathology & Cytopathology 5th edition. Cambridge University Press; 2015. P. 2500. Zynger DL, Yang X. High-grade prostatic intraepithelial neoplasia of The precusor lesion of prostate cancer. Int J Clin Exp Pathol 2009;2:327-338. 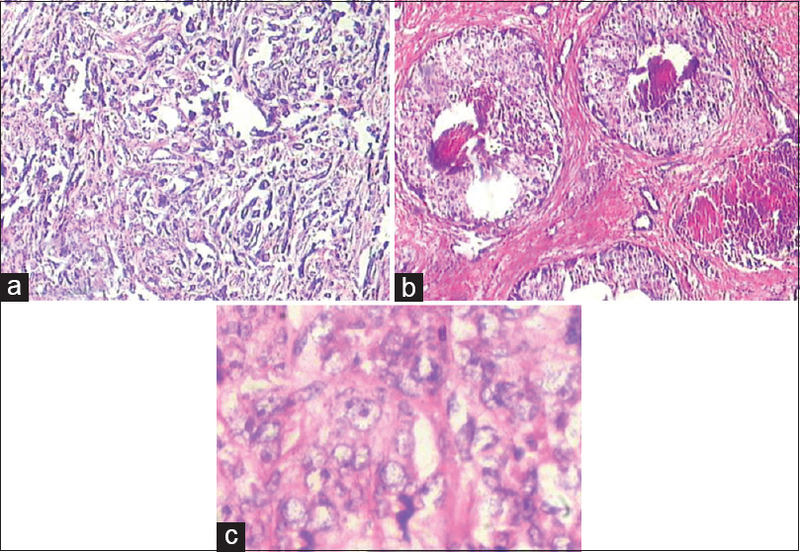 Singal P, Kaur J, Kundal RK, Singh H. Clear cell cribriform hyperplasia of prostate- A case report. Ann Int Med Den Res 2017; 3:25-27. Herawi M, Parwani AV, Irie J, Epstein JI. Small glandular proliferations on needle biopsies: Most common benign mimickers of prostatic adenocarcinoma sent in for expert second opinion. Am J Surg Pathol 2005;29:874-80. Kaleem Z, Swanson PE, Vollmer RT, Humphrey PA. Prostatic adenocarcinoma with atrophic features: Study of 202 consecutive, completely embedded radical prostatectomy specimens. Am J Clin Pathol 1998;109:695-703. 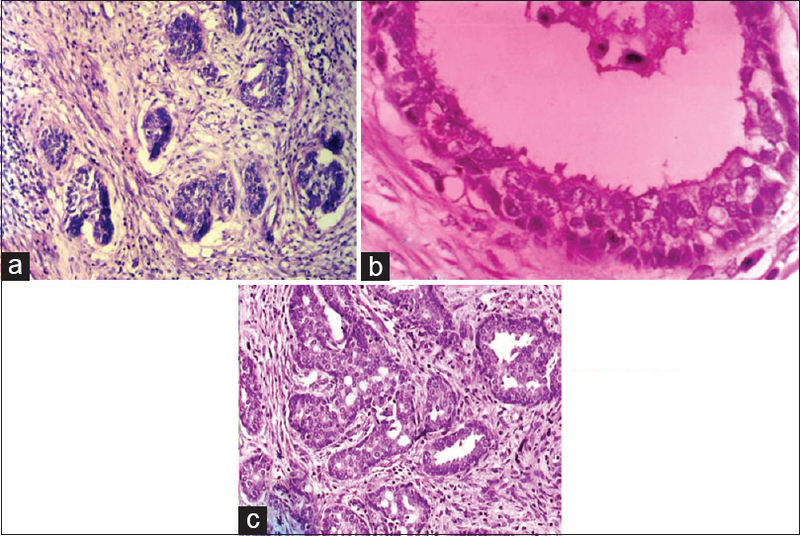 Armah HB, Parwani A. Atypical adenomatous hyperplasia (adenosis) of the prostate: A case report with review of literature. Diag Pathol 2008;3:34. Gaudin PB, Epstein JI. Adenosis of the prostate. Histologic features in transurethra specimens. Am J Surg Pathol 1994;18:863-70. Ratanarapee S. Diagnostic pitfalls of prostatic adenocarcinoma in biopsy specimens. Asian Arch Pathol 2013;9:45-56.